Last week I managed to get out in the morning for a walk before it rained again. 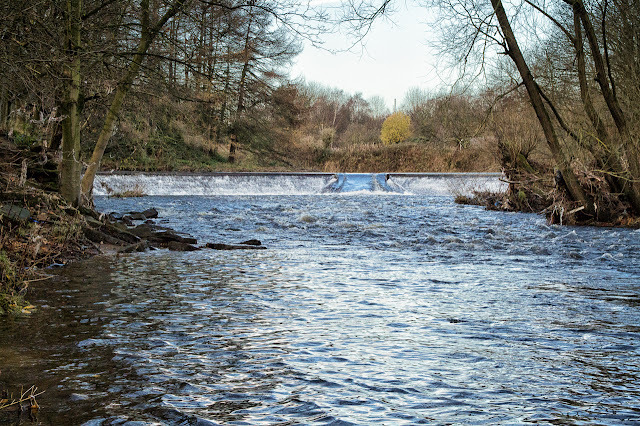 I had dropped my wife off at work and had a couple of errands to do in the Leeds Road area of Huddersfield so I headed off for the Calder Valley Greenway path at Deighton/Bradley. 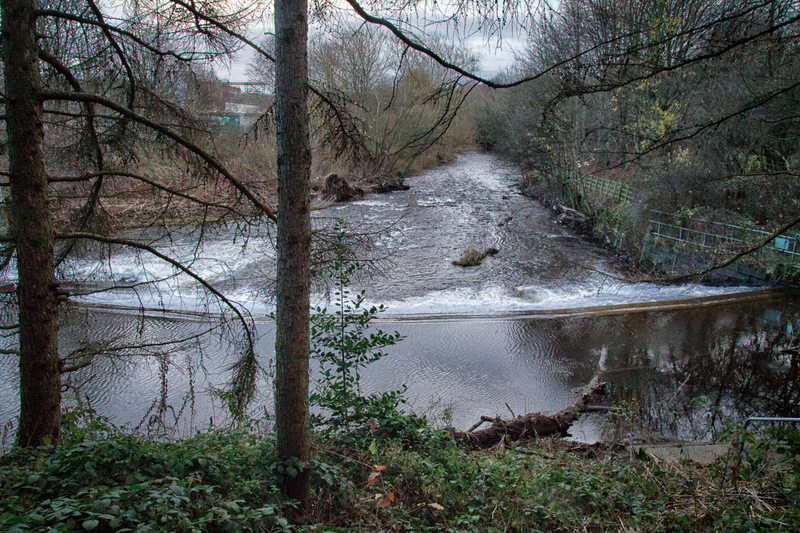 I had intended on following the path towards Mirfield and then head back along the river or canal side. Unfortunately the path was closed at Dalton Bank Road due to bridge strengthening work so after I had crossed the old railway viaduct I headed on a path down to the River Colne and decided to follow that path instead. I reached the river next to a weir which I hadn't known about so it was a nice surprise as a subject for my photos. There was a set of stairs from the river bank which took me right down to the edge of the river where I could walk alongside a fence to the place where I took this first photo. 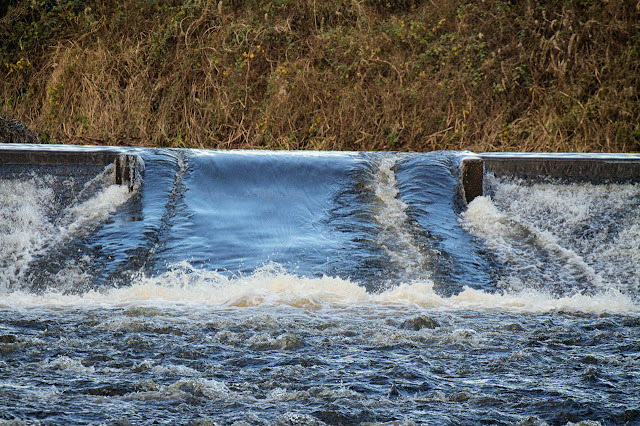 I quite like this composition looking along the wall of the weir. 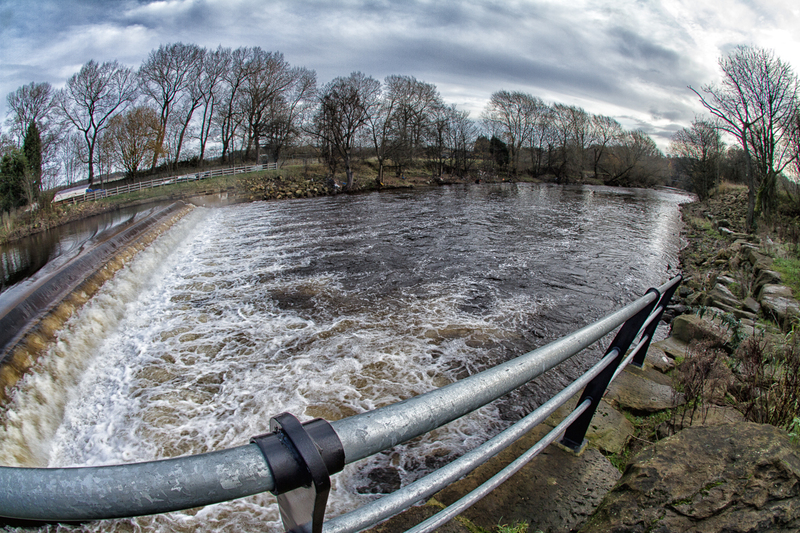 Then on the way back towards the steps I took this second photo of the weir from a different angle. The overhanging branch gives a little bit of foreground interest to the image. Further back towards the step this next photo was taken with a fisheye lens to get a very wide view of the area. The steps can be seen on the far left of the photo and the overhanging branch and fence are on the far right. The reflection in the water shows a large patch of blue sky that was appearing between the clouds in the sky. 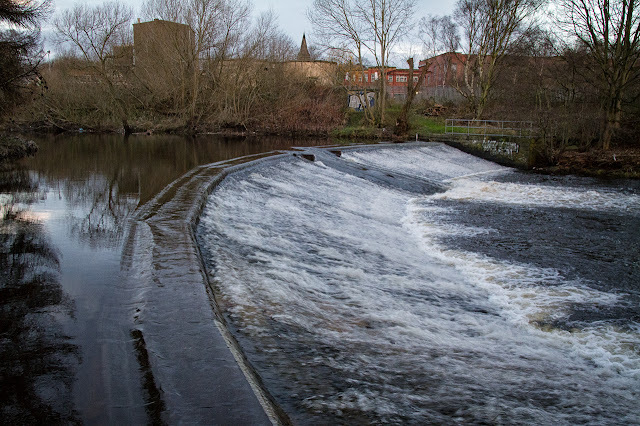 I went back up the steps and along the path a little way to take this next photo looking down the river over the top of the weir. Now the steps are at the bottom right of the image and the fence is about half way up. I walked on the path and under the viaduct where I took a few more photos which I may include in a later post but I am just including weir related photos today. After a while I turned around to head back down the path following the river downstream. A couple of hundred yard (or meters) down the path was another set of steps going down to the rivers edge. 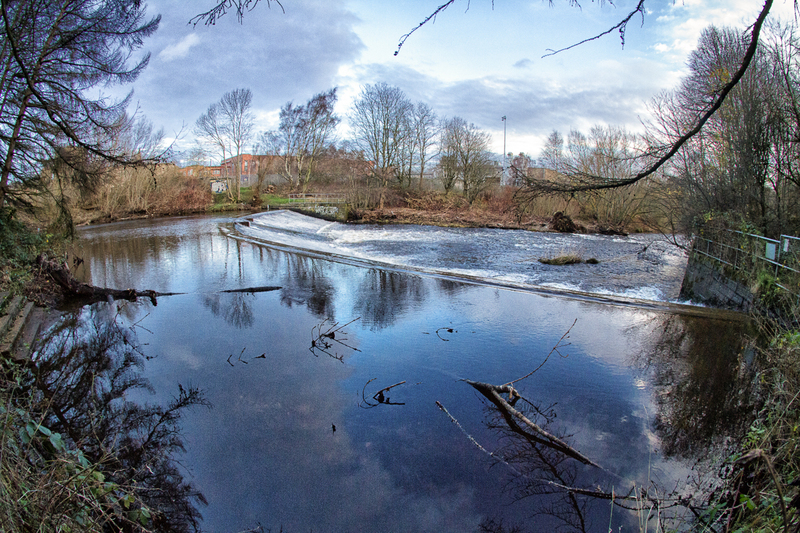 This next photo is looking back up the river towards the weir where I had been earlier. I swapped my lens for my big telephoto one to take this next shot of the centre part of the weir which I am assuming may be designed to allow fish to make their way upstream. The path came out at the end of Dalton Bank Road near Colne Bridge Road which I followed for a while up the hill where I picked up the Greenway path again to walk along. Again I took a few photos but I found nothing of great interest. The path reached a road that was heading towards Mirfield but it was a fair way and I wasn't sure whether I could get back down to the river or canal in that direction so I turned around and headed back to Colne Bridge Road. I checked the map when I got back home and found that I should have persisted because a little way along the road was a another road which crossed the river and gives access to a path which goes between the river and canal back towards Cooper Bridge. Must do more research before I go for a walk in future. 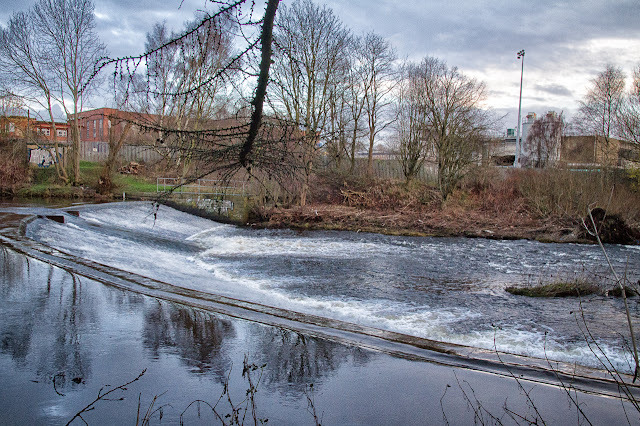 Anyhow, on Colne Bridge road I got onto a path next to the canal from where I found a bit of road which took me to where the River Colne joins into the River Calder which flows down the valley from Halifax. 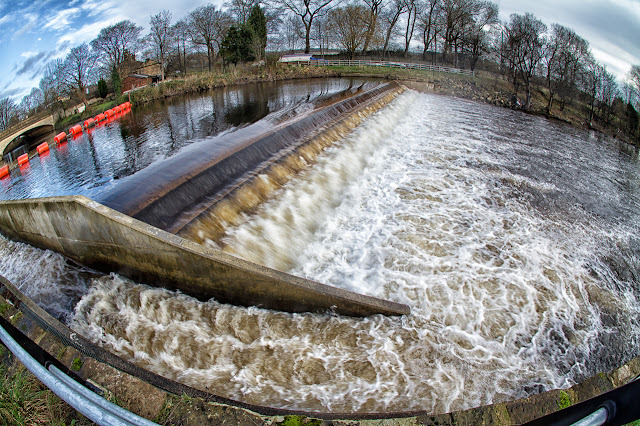 I followed the road upstream by the River Calder where I found the weir in this next photo. I used my fisheye lens again so I could include the fish run up the side of the weir. The red barrier in the river at the left of the photo is to stop boats heading over the weir instead of entering the canal system. The last photo is the same weir and looking downstream towards where the River Colne joins the River Calder. The clouds were starting to look heavier so I headed back up the canal path towards the viaduct and the path which brought me back up to the Greenway path near where my car was parked. Got back just before the rain started so that was good. I was quite amazed that the river levels weren't much higher than they were after what seems like weeks of rain which has been quite heavy at times. I know other parts of the UK have suffered with more floods but around here doesn't seem too bad. Not sure what I will have in my next post but hope to get something together soon.